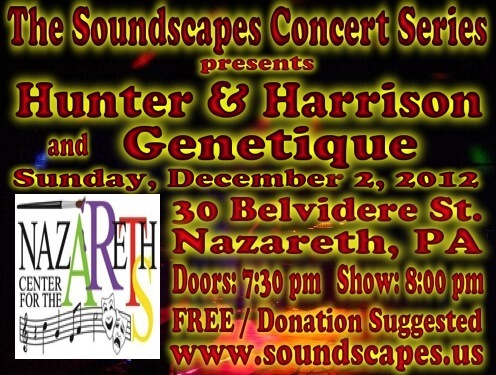 Here is the archive of Soundscapes Concert #19 featuring Hunter and Harrison and Genetique. It took place at the Nazareth Center for the Arts on Sunday, December 2, 2012. Genetique opened the evening and Hunter and Harrison played the second set. Video art was by Mike Hunter and Laura Woodswalker. Special thanks to Dave Sneed for providing and running lights. HUNTER and HARRISON: This is the duo of Mike Hunter (Ombient, Mayakara, Brainstatik) and Harrison McKay (Tangent Project). This duo loops soundscapes using guitars and electronics. Their music is described as an improptu collision of otherworldly tones mixed with repetitive shapes, shimmering slabs of sound, and unexpected dissonance. Mike is also the host of Music with Space on WPRB in Princeton, NJ. One feature of Mike's show is the support of live radio concerts by local musicians as well as touring musicians passing through the area. 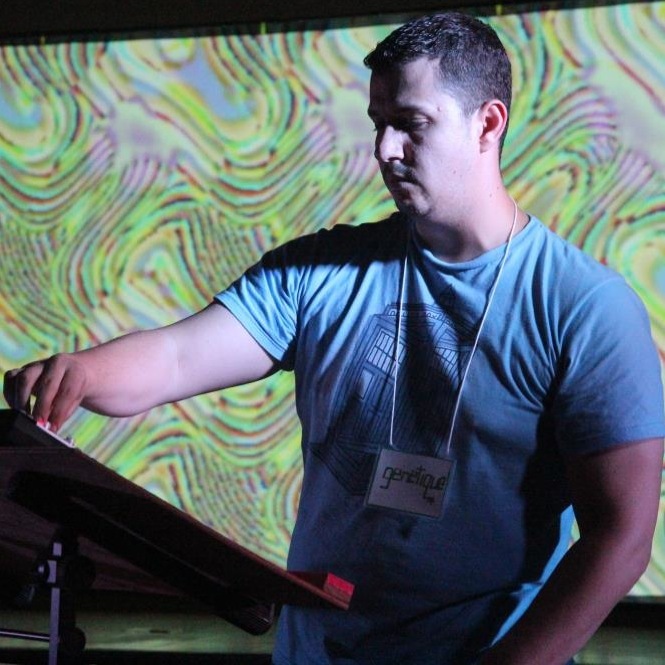 GENETIQUE: Aaron Todd is from the Philadelphia area and has been composing electronic music for five years under the name Genetique. Recently, he has performed at Electro-Music 2011 and 2012. A major part of Aaron's music is live manipulation and deformation of rhythmic elements. Many of his themes evoke the feeling of travel by the use of textures that slowly evolve throughout the song. Aaron utilizes both hardware and software instruments and tends to write music in a minor key that does not conform to any particular genre. His influences include Aphex Twin, Autechre, Tipper, and Cex. Here is Genetique's full concert.